less than 1.5% of existing stock. Of this space, the majority will be in Melbourne and has already been pre-committed. With business confidence in positive territory, we anticipate the uptake of stock to continue, despite limited availability in both Sydney and Melbourne. 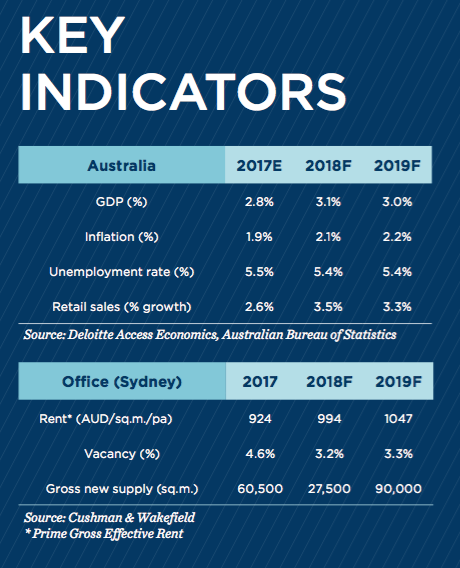 As a result, we expect vacancy to compress in all three markets, with Sydney forecast to be the tightest at approximately 3% by the end of 2018, the lowest level in over 25 years. A wave of infrastructure and development projects is sweeping across Australia’s major capital cities, promising to drive economic growth and create employment opportunities. The largest scale of development is underway in Sydney, totaling over AUD 60 billion, including Sydney Metro, Light Rail, and WestConnex. In Brisbane, a further AUD 20 billion worth of projects is underway, including a parallel runway at Brisbane Airport, the Cross River Rail, and the Queen’s Wharf. Melbourne is also set to bene t from projects including the AUD 11 billion Metro Tunnel and AUD 6 billion West Gate Tunnel and Monash freeway. Together these projects will transform the cities, facilitating more efficient movement of passengers and goods. of development and infrastructure projects is helping to drive jobs growth in the Professional Services sector, especially engineers which have seen job advertisements grow by 12% over the past year. With more projects to begin next year, the sector should continue to support office demand in Brisbane. After a slow 2017, new supply in Tokyo’s Grade A o ce market is set to surge from 2018 to beyond even the 2020 Olympic Games. The details of new development projects past 2020 are also emerging as real estate developers continue to be backed by favorable nancial conditions. Among the ve wards, Minato ward will account for the largest portion of the new supply through to 2023. Although we expect a reduction in new supply for the year 2021, the impact of supply in 2018–20 and the associated secondary vacancies will be that market conditions remain tenant favorable for the foreseeable future. Grade A market conditions will of course have an impact on the non-Grade A o ce market and this impact will become evident from 2019, evolving in tandem with the emergence of secondary vacancies. 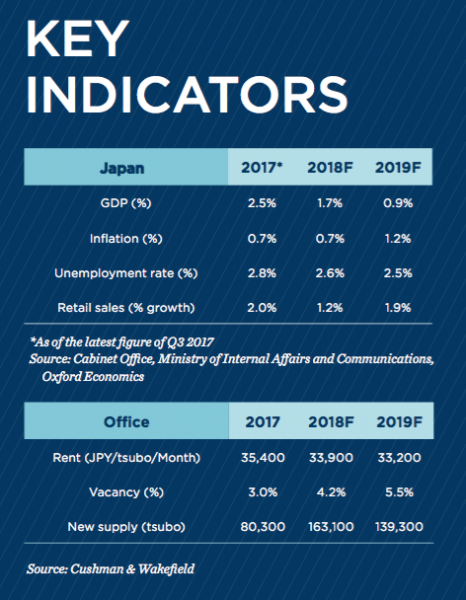 Japan is still behind its global peers in terms of the adoption of coworking space, with relatively lower workplace standards for traditional Japanese companies. Due to tight labor market conditions, companies have started seeing an increasing need for an improved workplace to secure talent. This is especially true where millennials are concerned, as they are well known for preferring a more collaborative and casual work environment. Global coworking space provider WeWork announced the 2018 opening of their first three Japan locations. WeWork won’t stop there as they have ambitions to open more locations. These efforts are echoed by those of major Japanese developers also looking to make headway in the coworking space. This type of positive activity will accelerate the adoption of innovative and collaborative workspace solutions for both existing companies and startups. The 2020 Olympics Games has catalyzed several significant infrastructure development plans in Tokyo. The new Tamachi-Shinagawa JR Station for instance, which also houses the Linear Motor Car terminal, will elevate Shinagawa’s position as the regional gateway to Nagoya and Osaka. The planned Bus Rapid Transit system to the waterfront will also enhance the connectivity of Toyosu/Harumi to other areas in the CBD. These new transportation infrastructure developments, by linking each submarket more effectively, will usher in a transformation of Tokyo’s office markets. 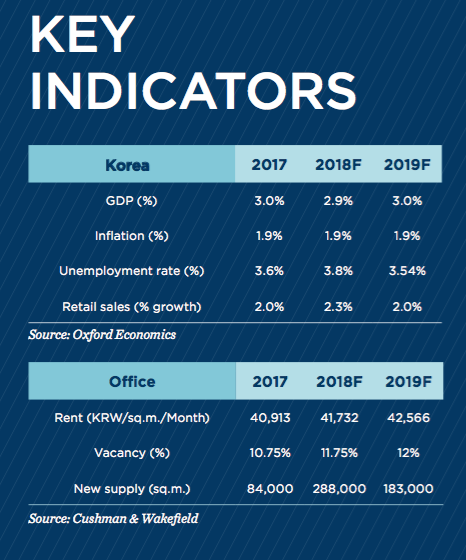 South Korea’s economic growth is expected to hit the 3% level in 2018, driven by rising exports, improving domestic consumption and growing investments. The Bank of Korea has recently raised its benchmark interest rate to 1.5% from 1.25% as the economy is showing steady growth. However, there are still risks including geopolitical tensions on the Korean Peninsula, concerns about the job market and financial market volatility. will relocate to the district where the group’s R&D center is also located. The Korean Teachers Credit Union (KTCU) is also expected to relocate once its new headquarters building is completed in the first quarter of this year. its fourth location in Arc Place and is expected to expand further cross each of the business districts. Not just foreign companies, domestic players such as, FastFive, Rehoboth and Toz are also expanding their business. 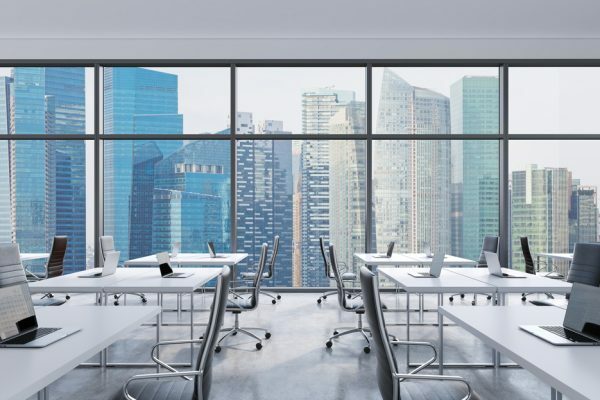 Many asset management companies are trying to attract these coworking space providers to reduce vacancy risk and maximize weighted average lease terms; coworking providers typically take on a long-term lease contract in large spaces. Guangzhou and Shenzhen, the two largest metropolitan cities in South China, have witnessed tremendous growth in 2017, recording annual o ce rental growth rates of 7.4% and 8.5%, respectively. The growth in rents was supported by strong net absorption of a combined 1.2 million square meters (sq.m.) in the two cities, exceeding the total new supply of 1.0 million sq.m. Guangzhou and Shenzhen also experienced strong job growth in the services sector with estimated annual growth rates of 3.0% and 4.2% in 2017, respectively, well above the national average of 0.3%. 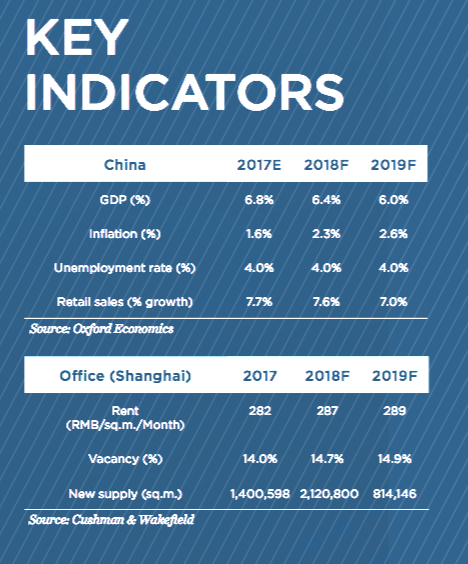 Oxford Economics forecasts that Guangzhou and Shenzhen will continue to enjoy strong service-sector employment growth in the 4-5% range in 2018 and 2019, driven by government initiatives such as the Greater Bay Area (GBA) plan and the Pearl River Delta (PRD) plan to further develop Guangdong province into a world-class trade hub. 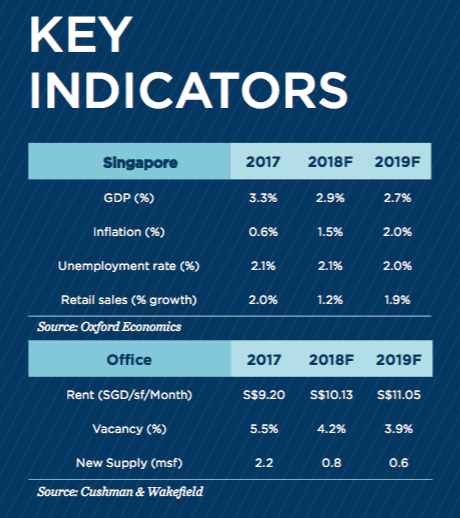 Consequently, this will continue to drive o ce rental growth in the core CBD areas of the two cities with annual growth rates in the 3-5% range possible over the next two years. Capitalization rates of China’s core office assets in first tier cities are now at five-year lows (sub 5%) and will likely remain at low levels in 2018 and 2019. Strong competition for stabilized office assets and high levels of liquidity are key driving factors. In 2017, capital values of office buildings in central business district (CBD) areas increased by an average of 6.3% and are expected to continue on a growth trajectory over the next two years. Rental growth, on the other hand, will likely grow at a softer pace on average across China’s first tier markets; thus, maintaining current downward pressure on achievable yields. Nevertheless, it is expected that tier one cities will continue to see positive rental growth in general though Beijing and Shanghai will likely soften to the 1-2% range due to a massive amount of forthcoming supply (totaling 3.0 and 2.9 million sq.m. over 2018 and 2019, respectively), while average rents in most tier two cities will likely remain stable or experience decline. Decentralized office markets in China’s tier one cities continue to attract new occupiers and investors as a wave of new, high quality developments come to the market. In 2017, decentralized markets in Beijing and Shanghai recorded higher absorption than CBD areas, with positive rental growth of 4.4% and 2.4%, respectively. Such outstanding occupier demand has increasingly drawn investors’ interest to these decentralized markets. For instance, in Shanghai, about two-thirds of the office investment deals completed in 2017 were for properties in decentralized locations. It is expected that with yields for office assets in core locations remaining at extremely low levels, good quality office assets in decentralized locations will continue to attract investors with higher yields and good potential for further capital value growth. of strong government policy support and the implementation of the central government-backed Greater Bay Area initiative that aims to deepen economic and city development coordination among Hong Kong, Macau and nine other cities in Guangdong Province. 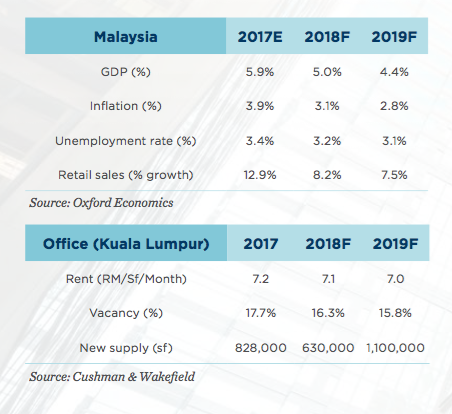 Competition for prime o office space is expected to intensify as only 10 sizable spaces (over 10,000 square feet, net) are available in Prime Central over the next 12 months. the development of Hong Kong East into a strong alternative core-o ce area on the back of improving connectivity with Greater Central as the journey time will be more than halved (to just less than 10 minutes) upon the completion of the Central-Wanchai Bypass in 2019 and convenient amenities around the neighborhood. a compelling enterprise solution option to individuals and corporates seeking exible lease terms and capital expenditure avoidance; 2) a pipeline of mainland Chinese and regional coworking space operators are looking to set up or expand in the city; and 3) a race among major coworking space operators to capture market share by expanding into different parts of the city. to 0.7 msf annually between 2018 and 2020. 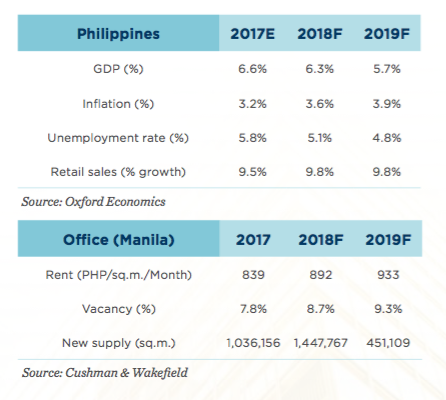 With the newly completed projects enjoying high occupancy rates due to increased leasing demand, the office market is now firmly tilted in the landlords’ favor. Major firms including French energy giant Total (125,000 sf), Shiseido (50,000 sf) and Sumitomo Corporation (43,000 sf) recently took up multiple floors at Frasers Tower, which has attained a pre-leasing rate of 70%. Competition in the coworking segment intensified when American giant WeWork entered the fray. After it acquired local player Spacemob, WeWork took up 28,000 sf at Beach Centre and 60,000 sf at 71 Robinson Road. It further ramped up the pace of its expansion by leasing 29,000 sf in a China Square Central heritage shophouse block, as well as 40,000 sf in the upcoming Funan. There is also market talk that Regus is in advanced negotiations to lease 40,000 sf at 18 Robinson. In addition, Chinese coworking player Ucommune (formerly known as UrWork) announced that it will be opening its second location at Suntec city in the first quarter of 2018.
on a rm footing and business con dence strengthening, the pace of rental growth will accelerate in 2018. Accordingly, Grade A Central Business District (CBD) rents are projected to increase by approximately 10% barring unforeseen circumstances. However, the rapid increase in rents could price some cost-conscious tenants out of the CBD. This has led to growing interest in decentralized o ces such as Paya Lebar Quarter, which is slated for completion in mid-2018 and has achieved a 50% pre-commitment rate. Private equity investors showed high interest not only in the residential segment, which has been favored, but also in the office, retail and logistics sectors. Private equity inflows into real estate touched a new high in 2017, at USD 6.6 bn, registering a 17% increase from the previous year. While established markets of Mumbai, Bengaluru and Delhi-NCR have seen the larger share of investments, cities such as Chennai, Hyderabad and Pune also saw healthy investor interest due to their inherent strengths and multi-sector manufacturing activities for automobiles, engineering goods, white goods, pharmaceutical products. Besides attractive returns, investors are now enthused by India breaking into the top 100 in the ‘Ease of Doing Business’ Index in 2017.
and logistics, by making them more price-competitive and increasing supply chain efficiencies. GST abolished various central, state and local taxes, enabling easier transfer of goods between states, which would give way to larger, centralized and advanced warehouses that would serve as hubs to service various states. Besides these sectors, the residential sector will come under the scrutiny of a regulator, which will provide comprehensive guidelines for developers and buyers. The Real Estate Regulatory (and Development) Act, 2016 (RERA) will make developers accountable and bring transparency in the market. Several states have already adopted the RERA, which will lead to better business practices. 29 msf across the eight cities, a 14% increase from 2017 levels. While the IT-BPM sector will be the dominant demand driver, Pharmaceuticals, Consulting, BFSI sectors will take greater strides in occupying office space. 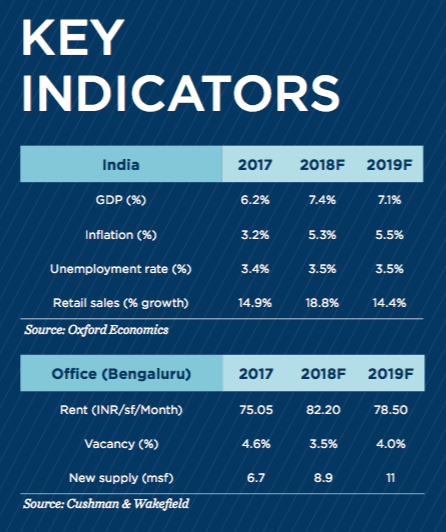 Similar to 2017, the current year too will see the highest demand for office space coming from Bengaluru, driven by corporate expansion, with Hyderabad emerging as a close competitor. We expect occupiers to continue to expand / consolidate in suburban locations across markets to improve efficiencies. Tight vacancies in prime locations will continue to push up rents, with Bengaluru again leading at 7-10% growth rate projected for 2018.
of Trans-Pacific Partnership (TPP). Favorable demographics, rising consumption and policy reforms have all supported the growth momentum that is fueled by a recovery in global trade. The Comprehensive and Progressive Agreement for the TPP, a revival of the original trade pact’s core elements, still hold huge potential even without the US. We expect 2018 to remain positive with all major economies growing on par with recent highs. At 27%, Southeast Asia’s internet economy is growing faster than expected, suggesting that domestic demand remains on a solid footing. Manufacturing and service sector growth will continue unabated and rising competition among cities to attract foreign capital could fuel further investments in infrastructure. Estimated infrastructure spending in the region is expected to hit US$110 billion a year until 2025; momentum of Belt & Road projects will continue to redefine real estate dynamics in the region. We expect large-scale infrastructure projects like Manila subway and Kuala Lumpur-Singapore High Speed Rail to start construction next year. 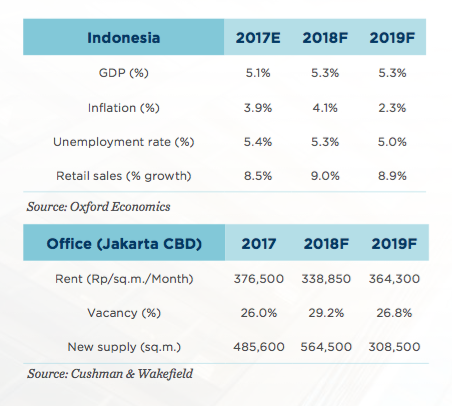 Meanwhile, projects in advanced stages such as North-South Metro, elevated rail and airport link in Jakarta are fueling transit oriented developments in the city. Mass transit projects are also underway in Vietnam, with the rst line due to start operations by 2020.
at H2 2019 to 2020 for newer options in the city. 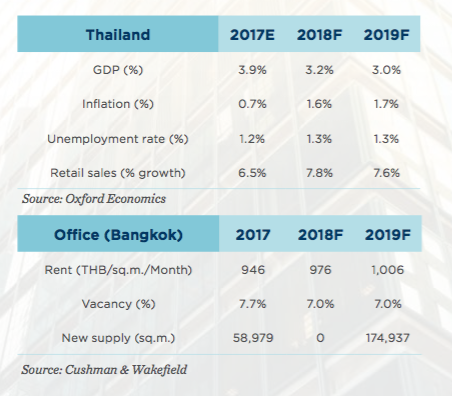 Similarly, new supply of 1.8 msf in 2019 will be a relief for occupiers in Bangkok, where average vacancies are among the tightest in the region over the last 3-4 years. for cost conscious occupiers. Markets such as Quezon City, Pasay City and Mandaluyong City which are 30-40% cheaper compared to Makati are experiencing a growing demand from o shore gaming and tech companies. 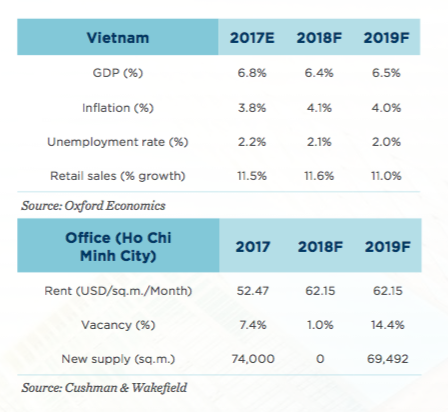 Tenants with future requirements in Ho Chi Minh City could ex plore options coming up in Thu Duc, District 9, and District 2’s Thu Thiem area besides CBD. Investors could also bene t from this demand spillover, capitalizing on rental and capital value growth while acquiring properties at cheaper valuations. Top 5 private islands near Singapore that you need to visit now!